The struggles in the videocard industry are a computer enthusiast's favorite spectator sport. From reading over product rumors leaked from mysterious sources to watching rival companies blast each other's technologies, there is nothing more exciting than a healthy videocard scrap. The G71 GPU, similar to its ATi R580 counterpart, is built on the 0.09 micron manufacturing process. Both graphics processing engines are clocked at a speed of 650 MHz and both support all the latest DirectX 9.0C Application Program Interface (API). Aside from that though, there are no other similarities as the architecture behind ATi and nVIDIA's cores is dramatically different. The brand spanking new MSI NX7900GTX-T2D512E videocard, priced in the region of $573 CDN ($499 USD/£287 GBP), is certainly entering the market for a lot less than we would have expected for a new flagship GPU from nVIDIA. The GeForce 7900GTX GPU is based on the 90 nanometre nVIDIA 'G71' core, and is backed up with 512MB of high speed GDDR3 memory. With the graphics core clocked at 650 MHz and the memory humming away at 1.6 GHz, gamers can expect a ton of 3D performance even with AA and AF dialed up! Get ready to follow along as PCSTATS throws a pile of gaming benchmarks at the new MSI Computer NX7900GTX-T2D512E videocard, and explores some of the new features that set the GeForce 7900GTX apart from the previous GeForce 7800GTX. The MSI NX7900GTX-T2D512E videocard is based on the PCI Express x16 form factor, there are no 8x AGP versions (for more information on PCI Express please see this article). The dual slot NX7900GTX graphics card includes two dual-link DVI outputs, and supports a huge array of video options via its 7-pin HDTV-out mini din connector (YPrPb Component Output, RCA Composite Output, S-Video Output). MSI's NX7900GTX-T2D512E videocard utilizes the GeForce 7900GTX reference design, which itself is nearly identical to the GeForce 7800GTX 512MB. It makes sense for nVIDIA and its partners to use the same 12-layer PCB layout, after all the nVIDIA 'G71' core is essentially the same 'G70' core built on a smaller manufacturing process and clocked a bit higher. The heatsink on the NX7900GTX videocard is particularly impressive; it has four nickel plated heatpipes and an ultra-quiet 85mm diameter variable speed fan (PWM controlled). 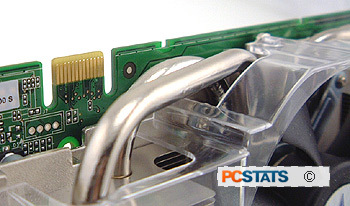 The reference cooling solution works very well, and very quietly, although it utilizes a second expansion slot. That extra space is used to exhaust some of the heat generated by the GPU outside of the computer case. 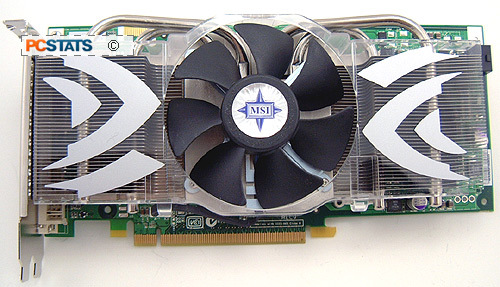 The fan hides most of the MSI NX7900GTX-T2D512E's features from view, but below it is a smaller heatsink which cools the videocard's power circuitry. On the top right hand corner, there is the all important 6-pin 12V power connector. Most recent videocards use this standardized 6-pin power socket and if your power supply doesn't come with one, an adapter is included. 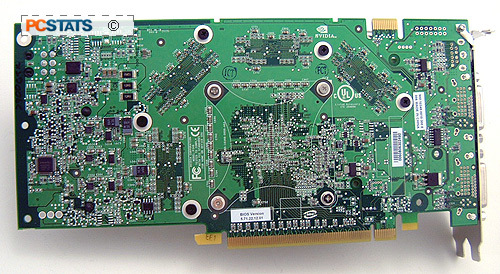 The videocard is fully SLI compatible, the bridge connector is located on the top left hand corner of the PCB and can run with another identical card on any nForce4 SLI platform. 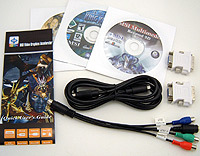 Included in the software bundle is a full version of the game King Kong (which is a new title), and CyberLink DVD solutions. MSI's Quick User's and Installation Guides are detailed enough to outline the basic steps you'll need to get the card working, however it would have been nice if a full manual was provided. The huge stock heatsink with its large fan just screams performance! The large but quiet cooler on this MSI videocard gives it a sense of awe, and is identical to the GeForce 7800GTX 512MB model. The heatpipe based heatsink makes direct contact via a copper heatspreader with the nVIDIA G71 core. The heatsink's aluminum base draws heat away from the 512MB of GDDR3 DRAM modules, and the whole contraption is connected by four 6mm diameter heatpipes to the stacked aluminum finned radiators. The airflow for all of this is generated by a large 85mm diameter temperature controlled fan. Noise levels are really low, which is always nice. According to the nVIDIA driver temperature monitor, the MSI NX7900GTX-T2D512E idles at ~41°C Celsius while load temps topped out at only 55°C degrees. During testing, even at times of heavy 3D load, the MSI NX7900GTX's vaneaxial fan was nearly silent under power. Its ATi Radeon X1900 XTX competition cannot claim the same feat, it is quite noisy while under load once that 65 mm squirrel cage fan spins up to full speed.